With MediaShout 6 you get presentation software focused on the needs of the Church, designed to be easy to use, and access to the best support team in the industry. 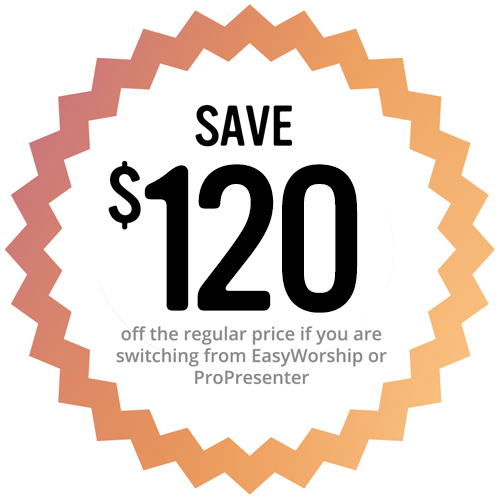 We offer special pricing for customers switching from EasyWorship or ProPresenter. In addition, we also have built-in tools to help you import your lyric libraries directly into MediaShout 6. As the first presentation software in the industry designed 100% for churches, MediaShout has many strengths that have made it a great choice for over 17 years! *Discount applies to $469 site license only. Call 888.829.7168 for more details and to place your order. WHAT MAKES MEDIASHOUT 6 UNIQUE? While other church presentation software have a per version charge of up to $40, we include 67 versions of the Bible absolutely free. This can save you hundreds of dollars and provides flexibility during services. You can manage liturgy content now as easily as you can song lyrics or Bible verses. This special tool includes features to easily handle call and response text, as well as save them for reuse later. No other church presentation software includes an inline editor. Now you can edit cues and slides from the preview window eliminating the need to open another window just to edit. We offer a simplified interface that gives your volunteers control to run a presentation without access to edit settings or content. This removes the stress for the volunteer and the worship leader.